In stock - low quantity. Order in the next 9 hours, 48 minutes and it will go out today! 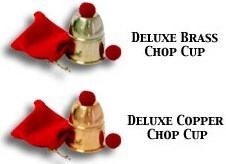 These hand-spun Chop Cups were manufactured with the secret gimmick inside, allowing it to withstand the closest scrutiny. Comes with single cup, gimmicked and ungimmicked crochet balls and durable cloth carrying bag.